Anyone who enjoys the combined flavors of chocolate and peanut butter, will absolutely love these delightful bonbon confections. Line a cookie sheet with parchment or waxed paper. Set aside. Place the butter, peanut butter, powdered sugar and vanilla extract in medium mixing bowl. Using a heavy duty mixer, or a wooden spoon, mix the ingredients into a smooth dough. Using two teaspoons of dough for each, shape the dough into balls. Place on cookie sheet and refrigerate. Melt the chocolate coating according to package directions. Remove peanut butter balls from refrigerator. Stick a toothpick into a ball and carefully dip the ball into the chocolate coating, leaving the top one-fourth of the ball uncovered. Place on paper-line cookie sheet, remove pick and continue procedure until all balls are coated. Refrigerate until chocolate is firm. 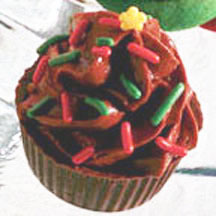 Tip: Coat bonbons completely with chocolate and decorate with candy sprinkles as shown in photograph.